As we honor our nation’s heroes this week, the words of our first president still resonate today with astute clarity. We have made major improvements in how our veterans are treated and appreciated over the years, but as long as we have homeless, addicted, mentally ill, and incarcerated servicemen, this mission is far from complete. 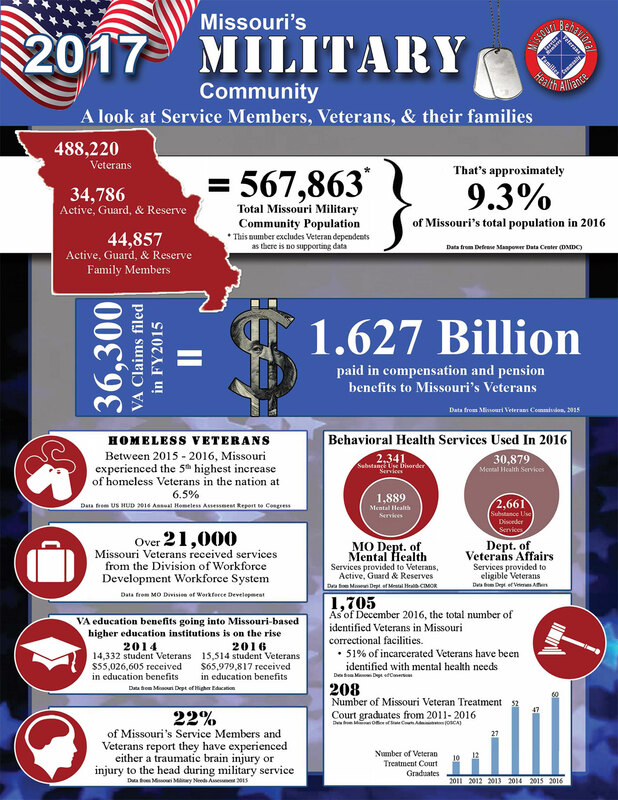 This infographic provides a great snapshot of Missouri’s service members, veterans, and their families; representing 9.3% of our state’s population. It also demonstrates the work that still needs to be done to improve the quality of life for the military community. Several state departments are diligently collaborating and working to swing the troublesome pendulum towards the positive. Veteran’s Treatment Courts are making impressive strides in getting some of our most vulnerable on the road to recovery. By utilizing volunteer veterans and active duty soldiers as mentors, our veterans feel open to discuss military specific issues and receive the special guidance they need. This model, which is nationally recognized, crosses the traditional jurisdictions of our state’s Courts and Probation offices. 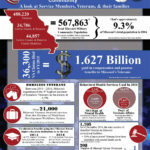 There are currently 10 Veteran’s Treatment Courts active in Missouri; up from 1 since its inception in 2010. In 2016, 247 veterans received the substance use treatment they deserved and needed. Since 2010, the number of veterans served has increased significantly each year, and 706 of our soldiers struggling with substance use disorders have participated in the program. For other behavioral health issues, our military families can access resources from the Department of Mental Health. These include self-assessment screening tools and information for children, traumatic brain injuries, substance use, sexual trauma, and PTSD. Download this fact sheet from the Division of Behavioral Health and the Missouri Behavioral Health Alliance. At Make the Connection, they can find resources that connect veterans, their families and friends, and other supporters to information, stories, and solutions to issues affecting their lives as they transition from active duty. It also has information about the life events and experiences that are unique to this population. President Obama exclaimed: “It’s about how we treat our veterans every single day of the year. It’s about making sure they have the care they need and the benefits that they’ve earned when they come home. It’s about serving all of you as well as you’ve served the United States of America”. These book-end presidents’ words remind us all to do our part and take action to serve those that served us.